A few hours before the Gold medal game between Canada and the United States at the 3rd World Deaf Ice Hockey Championships in Amherst, U.S., Roy Hysen spoke openly about some things while drinking his coffee. Regardless of what the subject of the conversation was, there was one constant — Hysen’s passion for Deaf hockey. A passion that would dictate his life until now. “If the players are happy then I’m happy,” said Hysen. 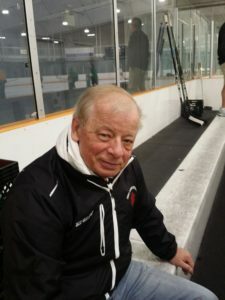 With 40 years of experience under the belt in hockey, Hysen is currently the General Manager of the Men’s and Women’s Deaf teams at the Canadian Deaf Ice Hockey Federation (CDIHF). A federation that he established in 1983 as well as the Men’s Deaf team a few years later. “It is high-caliber hockey now. We have an elite coach and qualified staff on the team,” said Hysen while remembering the humble beginnings of Canadian Deaf hockey. 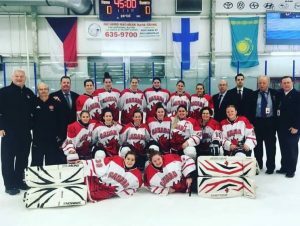 The CDIHF is now affiliated with Hockey Canada, which allowed to both Deaf teams to put on the iconic uniform in Amherst that is also proudly worn by the National Hockey and Sledge Hockey team. The affiliation with Hockey Canada open doors to significant resources that will serve both the players and staff. Hysen has witnessed all the historical moments of Canadian Deaf hockey history, including the latest. The Women’s team took part in its first competition in its history in Amherst. The team took part in a series of two demonstration games against the United States that they won. When Hysen talks about how the Women’s team was created in 2016, we can see pride and respect in his eyes. The CDIHF wanted to establish a Women’s team for a few years, but the lack of players and resources made the task more difficult. However, this changed in 2016 when Hysen and Jeff Sauer discussed the future of Deaf hockey during a training camp in Kitchener, Ont. Sauer coached the Deaf Men’s and Women’s teams as well as the Men’s Sledge Hockey team. He also helped Hysen and company to develop the CDIHF. The mutual respect and collaboration between Hysen and Sauer goes back to more than 35 years. “Jeff took hockey at heart and it wasn’t important in what country. He wanted everyone to have a chance to play and represent their country,” explained Hysen. “After he passed away this winter, a few members of the U.S. Deaf Women’s team contacted me and asked that I continue to work towards establishing a Canadian Women’s team,” said Hysen. It’s his weakness, but a good one. “This is the passion of hockey. They just want to play,” said Hysen. He and his team worked hard in forming a Women’s team in time for the 3rd World Deaf Ice Hockey Championships. The challenge now is to ensure that the team continues to grow and improve. With its recent nomination as the President of the new International Deaf Ice Hockey Federation (IDIHF), Hysen wants to accomplish the following two goals: make Women’s Hockey an official sport for the next Winter Deaflympics in 2019 and develop By-Laws & Constitution for the IDIHF. “I would like to take a few months off now that we have won silver in Amherst and the season is over,” said Hysen. However, he is not the kind of man to sit on his laurels. His passion for hockey remains as strong as it was 40 years ago when he was playing for the Hamilton Red Wings in 1967 in the Ontario Hockey Association. Hysen never stopped investing his time and energy to the cause of Deaf hockey. Even after several medals, eight Winter Deaflympics and three World Championships to his name, it is very rare to see Hysen smile. The man is too busy analyzing the current gaps and planning the next step to ensure that Deaf hockey in Canada continues to strive. Every story has its pioneer and every pioneer has its story.